The Empires of Faith project is delighted to collaborate with other scholars and curators from the British Museum and Oxford University, and from across the world. Below are just a few of those without whom the project would not have been possible. Currently a member of Beyond Boundaries, Robert worked on Empires of Faith for the first two years of the project, and since then has continued to contribute to the growth and development of the project’s objectives. He has been a tireless friend and patient colleague to us all. Belinda was involved with the project from its inception, helping to set the ground for the years ahead. She has since moved on to bigger and better things, and is currently the Curator of International Touring Exhibitions at the British Museum. We first met Paul when he was curating the fantastic Life and Death: Pompeii and Herculaneum at the British Museum in 2013. Since then, he has become Keeper of Antiquities at the Ashmolean Museum, Oxford, where he has been a constant source of support, and instrumental in the Imagining the Divine exhibition. Clarice has been a friend of the project from very early on, helping to bring to life one of our first conferences with her fantastic illustrations. Since then, Clarice has designed the Empires of Faith logo, and consulted on the design of numerous project outputs. Mallica has helped with so many aspects of the project, it is difficult to count. From guidance with the collections of the Ashmolean, to object handling sessions with the students of Talking Religion, Mallica has been a constant source of knowledge, help, and optimism. Formerly a Curator in the British Museum’s Asia Department, and now a lecturer at the University of Edinburgh, Yuthika has also managed to squeeze in a role as a co-curator of Imagining the Divine. Claudia was first involved with the project as a respondent at the Empires of Faith conference in Chicago. Her incisive contributions there opened up new avenues for the project, and she has since contributed the Epilogue to Images of Mithra. Barry and Jaś co-ran the Interrogating the Antique Visual Tradition and Its Legacy, at the 2015 international summer school, Globalized Classics, held at the Humboldt University. The comments, criticism, and guidance that Barry (and others) have offered both then, and in the following years has been instrumental for the project. Jesse was a key contributor at the Globalized Classics summer school, and has also co-written chapters in Empires of Faith: Histories of Image and Religion in Late Antiquity, from India to Ireland (under review). In her role as Manager for The Oxford Research Centre in the Humanities (TORCH), Vicky has gone above and beyond in helping to get many of the project’s more ambitious project’s off the ground. Along with other members of TORCH, especially Elleke Boehmer and Rabyah Khan) she has been a great friend, and all whilst trying to complete her PhD. 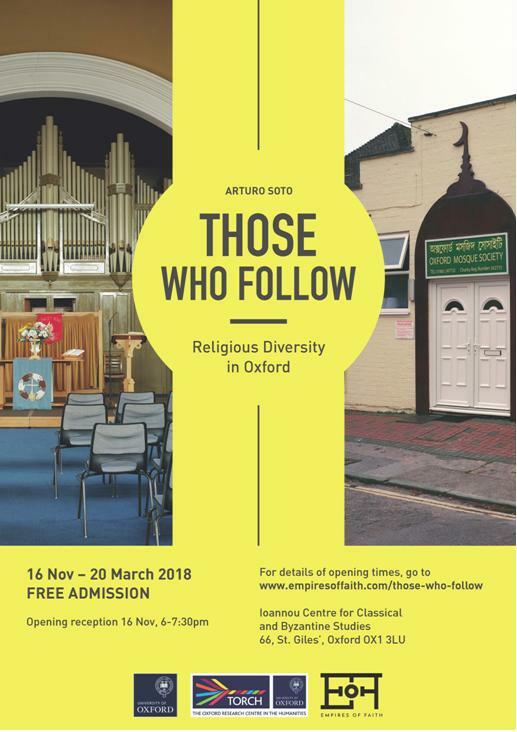 Arturo is the photographer and vision behind Those Who Follow, giving up his free-time to trudge across Oxford with his very large camera, just to capture some of the city’s lesser-known gems in all their glory. You can find out more about the work Arturo has done and great contribution he’s made on the exhibition pages. Naomi is a DPhil candidate in Theology and Religion at Oxford and became involved in the project after she and Stefanie (Lenk) met when both her own podcast project (The Remedy) and the Talking Religion programme won awards from TORCH! She has since collaborated with Empires of Faith in running workshops for both exhibitions. Her own research focuses on questions of gender and sexuality in the Born Again Christian movement. Sam is a Masters student in Archaeological Science at Oxford, having studied for her BA in Classical Archaeology and Ancient History. Sam has been a Curatorial Assistant on Those Who Follow, helping to setup the exhibition and organise the events that have run around it.